Born in Mpouroundi – Central Africa in 1964. Graduated with excellence from Medical School of Kapodistrian University of Athens – Greece in 1989. Following graduation from the medical school of Athens he served as a general practitioner in rural areas of Greece for three years. Ophthalmology training was accomplished in Rion University Hospital, of Patras – Greece. After his training in ophthalmology he became a consultant in the general hospital of Patras “O Agios Andreas”. From 2000 to 2001 he took one year funded fellowship in University Hospital of Geneva – Suisse for vitreoretinal diseases under the supervision of professor A.Safran and C.Pournaras. He accomplished his PhD, in Geneva in 2005 and published over 40 papers in international peer review medical journals. Additionally he has contributed in authoring in several books of ophthalmology. He was also invited for more than 20 lectures. 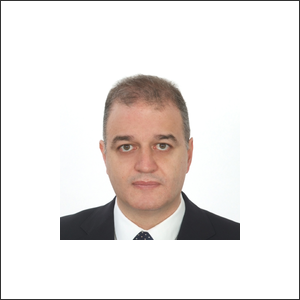 Except the clinical work, he is actively involved in the ophthalmology residents’ education in cooperation with the university hospital of Patras and in the clinical research. His current post is a NHS director at the dpt of ophthalmology in the general hospital of Patras “O Agios Andreas”.